In this tutorial, we will be covering how to perform some basic IPTables changes that will greatly help secure your server. This is done on a fresh install of Ubuntu 14.04 64bit in our Cloud. This can also be done on any version of our Ubuntu 12.04 OS as well as Debian. All of our commands are run as root and file editing is done via vi. If you are using another user to do this, you will need sudo access. You may use any file editor you would like. 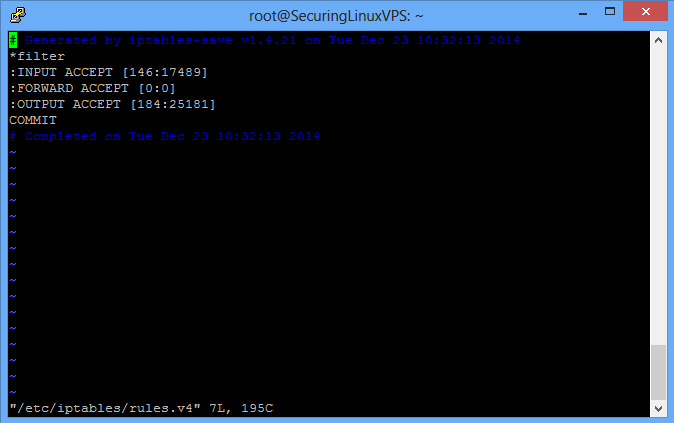 This will list out any rules you have running and verifies for you that you did install iptables and it is working. At this time, it’s just empty but you can see the three types of chains available. Next, we will install the iptables-persistent package. What this does is it will write out our current IPTables rules to a new file (/etc/iptables/rules.v4) and it will handle automatically applying our rules upon reboot. Pretty helpful! When you enter the file, it should look like the above picture. There are a few things that we will want to add before our first custom rule. This would be a rule for the loopback interface and one for traffic that is already established. You can see these below. The first custom rule we are going to add will allow SSH access to our server. We’ll want to add the rules above the COMMIT line as COMMIT delimits the end of our INPUT, FORWARD, and OUTPUT ruleset. To find out what all the IPTables segments mean and more information about them, please see our IPTables section. What this does is it tells IPTables to block and drop all traffic that is not going to ports you specify to allow through. This will stop people trying to break in using services that you have running unless you have opened those ports to the public. You should see something similar to the below page. Where IPADDR is your IP address that you want to have SSH access to your server. If you did not set up a custom SSH port, you would want that to remain 22 and not 3389. And now the Internet has access to the web hosting you are doing. Keep in mind, when adding new rules to either INPUT or FORWARD sections, it is a great practice to keep the new rules lumped together with like rules. INPUTs with INPUTs and FORWARDs with FORWARDs. You will also want to make sure that any rules you add that allow a new port through are listed ABOVE any reject statements for that rule set. If they are listed after any reject lines, the rules will not take effect. To see output of what IPTables is doing and/or blocking with its rules, you can run the below. It will print out the rules you have and anything packet wise about dropping connections or allowing them through. To find out what all the IPTables segments mean and more information about them, please see our IPTables section (link). Note: If using Atlantic.Net Cloud Services, You can always access your server via our VNC viewer in the Cloud Portal if you lock yourself out.